The all-new Toyota Mirai hydrogen fuel cell vehicle launches in Japan on 15 December, before being introduced into the UK and other selected European markets in September 2015. Mirai – the name means future in Japanese – signals the start of a new age of vehicles. It uses hydrogen, an important future energy source, to generate electric power, delivering better environmental performance while giving customers the convenience and driving pleasure they expect from any car. Mirai uses the Toyota Fuel Cell System (TFCS), which brings together fuel cell and hybrid propulsion technologies. It includes Toyota’s new, proprietary fuel cell stack and high-pressure hydrogen tanks. The TFCS is more energy efficient that internal combustion engines and emits no CO2 or pollutants when the vehicle is driven. A generous cruising range and a hydrogen refuelling time of around three minutes provide the same level of convenience as a petrol-powered car. 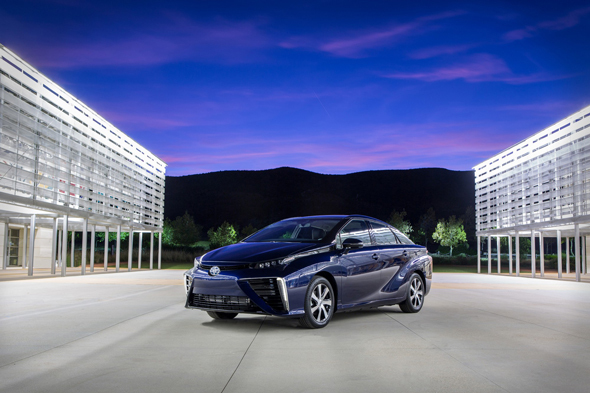 Mirai delivers everything expected of a next-generation car: an immediately recognisable design; an exhilarating drive that stems from the superior handling stability secured by the car’s low centre of gravity; and quiet but powerful acceleration delivered by the electric motor. Hydrogen has the benefit of being able to be generated from many different natural sources and man-made by products – even sewage sludge. It can also be created from water using natural, renewable energy sources such as solar and wind power. When compressed, it has a higher energy density than batteries and it is relatively easy to store and transport. These qualities give it the potential to be used in the future for power generation and a wide range of other applications. FCVs can generate their own electricity from hydrogen, which means they can be a key contributor to making a future hydrogen-based society a reality and accelerating energy diversification. The Toyota Mirai will be launched in the UK, Germany and Denmark in September 2015, followed by further national markets in 2017. UK pricing and equipment specification will be announced at a later date. Toyota Mirai is manufactured exclusively at Toyota’s Motomachi plant in Japan. You are correct in the points you make. Infrastructure is very limited at the moment and a lot of time will be required to establish this. However we are working on the basis that if the cars are available now then this can only help stimulate infrastructure growth. Still a long way to go but we do have to start somewhere.